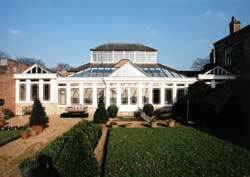 Would you like to have a conservatory that is an enhancement rather than simply an addition to your property? Add value, style and individual character to your home with a conservatory crafted from natural timber. Provide a natural enhancement to a property and often more in harmony with the building than one fabricated from upvc or aluminium profile. Each hardwood conservatory is individually designed to customer specification, allowing the flexibility to incorporate individual design features that extruded profiles cannot offer. In some protected areas, upvc and aluminium conservatories are not permitted, with timber being specified as the natural material in keeping with the character of the locality. Supplied in natural or painted hardwood, the conservatory can be maintained in pristine condition for generations, unaffected by UV and other weather conditions. 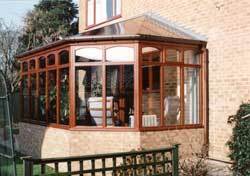 We design manufacture and install wooden conservatories for all types and sizes of buildings. From summerhouses, orangeries, poolhouses and small house installations to barn conversions, garden centres and property conservation projects. Please do not think that a handcrafted hardwood conservatory is going to be expensive. Our conservatories can cost little more than extruded ones but the additional value-added is considerable – representing an excellent property investment. Please view our Products page to see more examples of how a wooden framed conservatory can add style and value to your home. Also see Conservatory Options for suggestions on the range of domestic conservatory choices – Victorian, Edwardian, P shape, B shape, L Shape.